I have just discovered how bad the photos taken by the current stock app actually are. But a lot more has happened since I got my 8 in December '17. I have just discovered how bad the photos taken by the current stock app actually are. But a lot more has happened since I got my 8 in December '17. I have recorded a lot of video with stunning OZO sound. From owls and wildfowl in my local bird reserve, a pheasant in the woods - both completely without a single "click", and silence that actually is SILENT. The sound is totally spatial - you can here precisely where every bird is in headphones. At the other extreme, I filmed a Polish samba band playing at last year's Bremen carnival at sound levels of at least 120 decibels with no noticeable distortion. Standing next to a Brazilian Repique drum, 12 inches in diameter, struck with a long plastic stick on its very tight plastic head, will deafen you, but my Nokia 8 recorded it without distortion. No more, OZO produces all sorts of background noise at low sound levels, birds sound like plastic bags in the wind. Drums distort. My phone hasn't changed, but the software has. Or perhaps I'm wrong? Only HMD's camera app records OZO audio. OZO surround is only recorded when the phone is held horizontally. Setting the OZO recording mode to either front or rear can produce audible artifacts ('bubbling' noise) depending on the audio source. Thanks 389. I was referring to use of the stock app and I always film horizontally. What I meant was that the sound used to be superb, even in quiet surroundings. Now I get clicks, not shutter sounds, at the start of every video and sometimes at irregular intervals, especially if I move the phone. I don't get any strange sounds while recording video (phone running on Android Pie). Did you try factory reset? @ Potemkin I did a factory reset after upgrading, which improved the problem with clicking noises. Ihad call quality issues with Oreo, but yesterday I made hours of calls to mobiles and land lines, without a single glitch. I also did the *#*#372733#*#* hardware test on Oreo, in which mic 2 clicked. The same test in Pie revealed no such problem. Is anybody else getting clicking sounds when recording video in Pie? and the other posts in that long thread. A possible workaround is to record 20-30 seconds of video before shooting the videos you want to keep. I still haven't figured out if it's an electrical or mechanical issue but it's worse now than it was half a year ago on my Nokia 8. Birds singing and loud music is still fine. Maybe a thorough cleaning helps but I can't see a safe way to do that without taking the phone apart and risk breaking something else. @ Hans Of course I am far from happy to hear that you also have the “ticks”, but is comforting not to be alone! I have a cover on my phone and always ensure there’s no crap in any of the apertures. Just did a 22 second movie and only got a couple of minor crackles. Nothing seems consistent on my 8 these days. I too get crackling or clicking sound on my videos with my Nokia 8, which is running all my videos. Chat support suggested trying safe mode and wipe data/factory reset, tried both multiple times without restoring backups, no joy. Here is a picture of such video when opened in audio editor. This video is shot at night, so background is very silent. All the tall peaks are the distortion. Has anyone found a reason for this or a cure, other than switching brands? I also get these clicks and tried to do some testing, "problem" is or not . Is these clicks all of a sudden for no apparent reason why, will just stop after 10 minutes or so of testing. The only thing that may be of relevance is from looking back at my videos.... for me it started some where between march and June 2018. 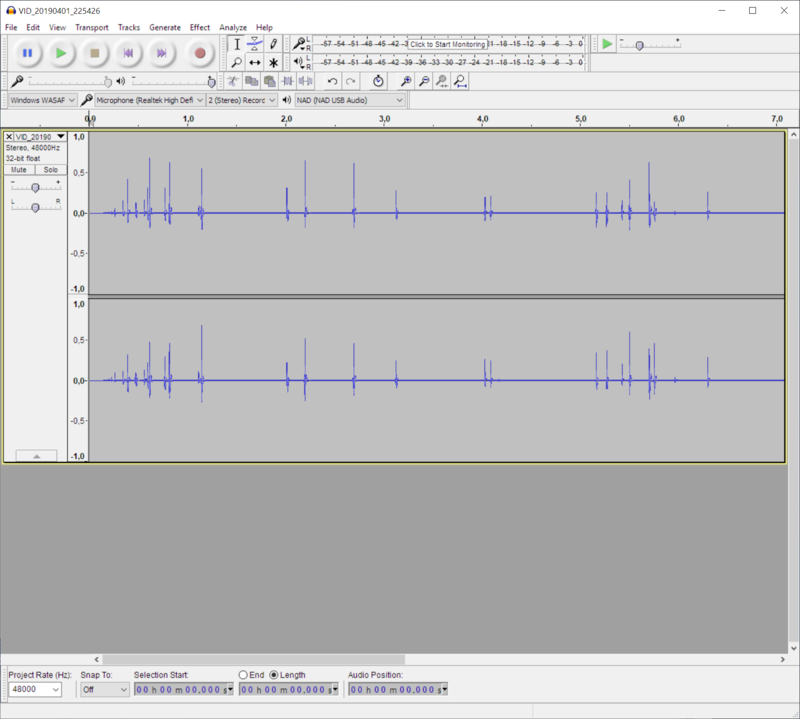 Reason is either buggy firmware or failing hardware (low quality microphones or something else). It's not limited to video recording, it happens with all kinds of audio recording on Nokia 8. Temporary mitigation is to make a test recording of 20 seconds or so to "warm it up", stop the test and then start recording again. Support person told me they will send complaint regarding this issue to their R&D department. I'm not optimistic about it. I noticed the same distortion on all audio recording apps too, except when I tried calling to other phone and keeping both on my ears. I couldn't hear any distortion, I suspect there is more processing done to actual phone calls. Anyway I already regret having this phone, turns out you can't have a decent piece of equipment without paying Applemoney for it. I do hope this problem is remedied soon enough. I got my device back, main board was changed. Problem persists immediately from the first video that I took... Maybe they didn't try it at all in the service. But the sellerman said, that I can send it back again.